The Fluence Z.E. concept will go into production in 2011. Renault is charging into the electric car game with four head-turning concepts that preview a quartet of production cars that will launch starting in 2011. The Fluence Z.E. concept is an electric version of the five-seat Fluence sedan and has a range of 100 miles. 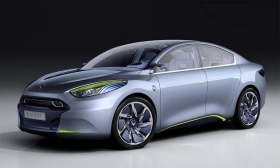 It will be the first to make it into production in the first part of 2011, Renault says. The Twizy Z.E. 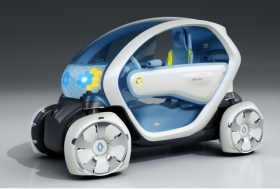 concept is an ultra-compact city car. It's slightly larger than a scooter and has a 1+1 layout. The top speed is 47 mph with the acceleration equal to a 125cc motorbike. Power comes from a 15-kilowatt motor. The Zoe Z.E. concept is a four-seat supermini for urban driving. It has scissor doors in front and butterfly doors in the rear. The motor is 70 kw, and it has a 100-mile range. It rides on 21-inch alloy wheels, has a retractable rear spoiler and mood lighting. The Kangoo Z.E. concept previews an electric van for fleet and commercial use. It has a 70-kw motor, solar roof panels and a heated steering wheel. Renault also unveiled a "Quickdrop" system, which would allow batteries to be swapped out in three minutes at special stations. Otherwise, the vehicles take four to eight hours to charge via a socket, or can get a quick charge in 20 minutes. The Twizy Z.E city car concept.